First off, I should clarify—I don’t have a problem finishing ALL things. For example, I have no problem finishing books. Or an entire bag of Costco-sized Hershey’s kisses by myself. Or following through on commitments I’ve made to people (usually). No…what I DO have a problem finishing, however, is anything to do with tidiness or hands-on projects in general. In school, I used to take art classes (before I stopped, at 16, because I was seated next to basically the most amazing artist of all time who actually later on to become a professional, so…yeah. #iquit #iknow #comparisonissues). Whenever I was in the middle of a project I actually cared about, I would always take the project home and work hours and and hours and hours on it, but then have to turn it in unfinished because I just kept wanting to go back and fix things. I’ve heard that having a problem finishing tasks is a hallmark sign of a perfectionist, and I can totally back that up. However, for years now I’ve really worked hard to combat my perfectionist tendencies and just get stuff done already, especially when it comes to stuff around our home (following the mantra of “Good enough for now is better than not done at all”). But it’s still something I struggle with. It’s meant that our house–already in the natural disarray from moving–was actually getting worse instead of better because I would unpack half a box and then leave stuff thrown all over other stuff in my quest to do it all perfectly. So yesterday, I forced myself to stop for a second and breathe. And when I did, I started thinking about a book my sister recommended to me (thanks, Sarah!) that I read about a month or so ago that I think has changed forever the way I think about housework and tidiness in general. 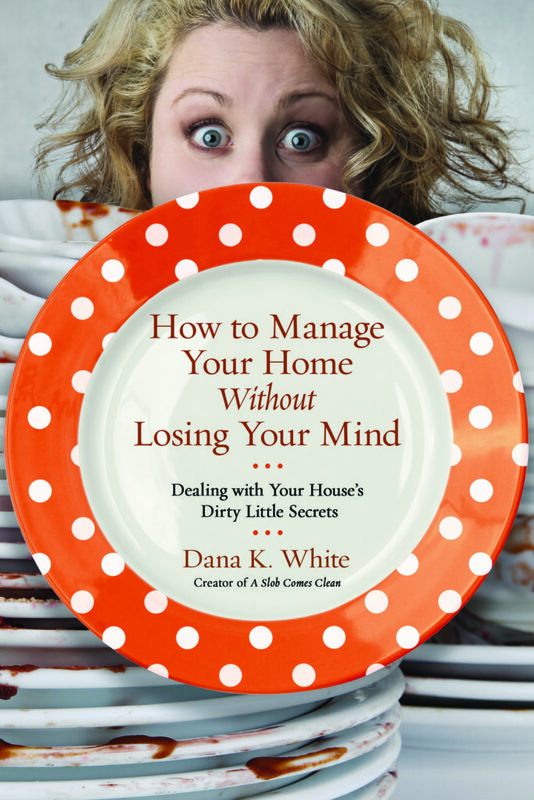 It’s called How to Manage Your House Without Losing Your Mind by Dana K. White (that’s an affiliate link, by the way, although this post is by no means sponsored–I just am obsessed with the book is all), and its premise is that it’s the one book on how to organize your home that’s written by someone who’s not naturally organized. I’ve been battling my slob-like tendencies for years (ask any of my college roommates or my mother), and although I made substantial progress a few years back when I got rid of a large chunk of my possessions, housework and being tidy do not come naturally to me. 1. Oftentimes, your house stays messy because the thought of tackling it ALL seems so overwhelming that there never seems to be a good enough time to start because you won’t get it all finished like you want anyway. The author makes the point that a lot of people with slob-like tendencies are actually perfectionists or highly creative people, which is why they love the idea of a good “project” but have a hard time with actual maintenance. But, as with any good “project,” a true perfectionist wants to make sure that once that project gets done, it gets done to perfection, so she keeps putting it off and putting it off until that elusive day when she’ll have time to tackle it all, and do it all perfectly. To combat this tendency (which I totally relate to), she outlines a simple 28-day plan to get your house under control that even the most cleaning-averse person can get on board with. Basically, it’s that for week one, you just worry about doing your dishes—ALL of your dishes, every day. On the second week, you worry about doing all your dishes every day, and then you start picking up and putting away clutter that’s in your bathrooms every night. And so on and so forth. Because the tasks are so straightforward, it’s hard to talk yourself out of it, and once that first day is done (which will always be the worst, because the dishes/clutter/whatever will have had time to pile up), then it’s much easier to maintain. This plan also makes it seem doable to clean up a disastrous house because it forces you to just focus on doing a few things and then adding to them over time, rather than trying to tackle the huge, daunting thing at once. 2. When she talks about decluttering a room, she tells you to not sort things into piles but rather to take the item where it belongs right then and there. This is counterintuitive because it requires more time and energy in the long run, but she makes an excellent point–most of us organize things into piles but then get interrupted to go do something else, and then by the time we get back to the project with all the piles, they have all merged together and morphed into bigger piles with non-related stuff and then the whole process starts again. But, if I take something to where it belongs right away, then at least I’ve made that progress no matter what, even if I get interrupted in the middle. For unpacking our house, this has been key. At first, I started out with the piles, but I was ALWAYS getting sidetracked, so I just forced myself to start taking stuff to where I wanted it to go right then so that I wouldn’t keep making things worse. I’m not sure if this is said explicitly in the book or not, but it’s kind of the feeling of it, and that’s the concept of just sticking with one thing until it’s finished, rather than allowing yourself to view THE WHOLE MESS and get overwhelmed. So yesterday, I focused on our kitchen. 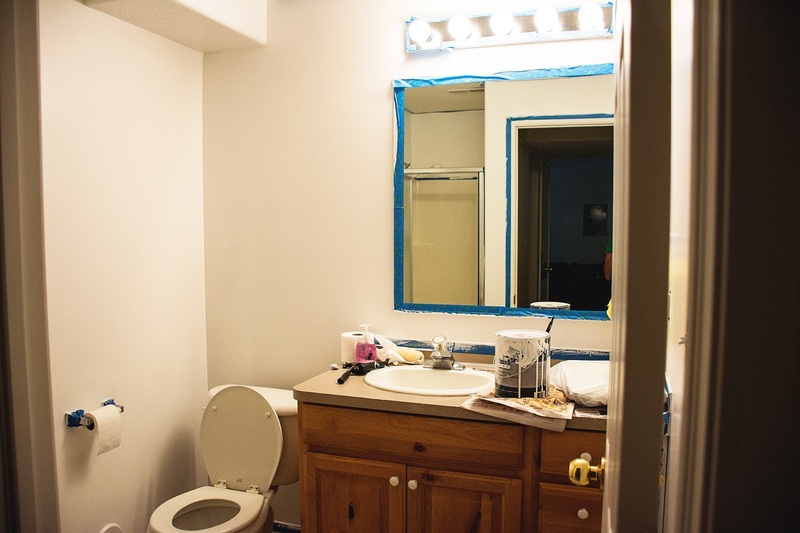 Rather than get sidetracked by all the boxes still left in the bedroom or the fact that our exterior shutters are currently red, white, and blue or on the downstairs bathroom that I still need to do the finishing touches on (pictured above), I just focused on the kitchen. I methodically went through each box that was still in there and put away the things one by one. If I didn’t know what to do with an item, I didn’t leave it until later, but I decided right then what to do with it, even if it wasn’t “ideal.” Good enough for now is better than not done at all. And even though not all the kitchen is done (because I had to make dinner and wanted to spend some quality time with Raven once she woke up from her nap), I still had gotten a noticeable amount done because I hadn’t let myself get sidetracked by anything else (and the project even earned me a “Wow, Wifey!” when Matt get home). Anyway, this post ended up being a lot longer than I planned, but if you’ve ever found yourself struggling to keep your home in order, I HIGHLY recommend this book. (I’ve included some affiliate links to it here, but whether you buy it or just get it from your library, it’s definitely worth your time to read it!). What are your best tricks for keeping yourself on track?